Island visited by 47 members. 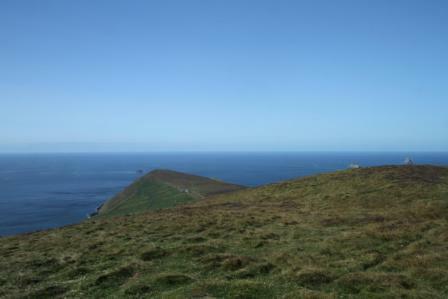 There is a signal tower at the highest point on Dursey in the townland of Tilickafinna. It seems likely that this hill was called Cnoc Bólais, since Penelope Durell records this name in Discovering Dursey with the meaning 'beacon hill'. Although the translation seems incorrect (bólas is probably related to dairying, from bó, 'cow'), this clearly links the name with the signal tower. A cliff nearby to the north called Foilbolus supports this. Cnoc Bólais is the 1272th highest place in Ireland. Cnoc Bólais is the most southerly summit and also the most westerly in the Slieve Miskish area.